FEATURES. 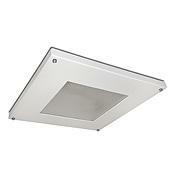 Housing consists of a shallow profile aluminum square frame featuring a standard .125" thick flat polycarbonate lens. Energy efficient LED comes available in multiple color temperatures to choose from. Corrosion and weather resistant oven baked standard white polyester powder coated finish. Built according to U.S. and Canadian safety standards. Suitable for Dry or Damp Locations. APPLICATIONS. Building Facades, Pedestrian Tunnels, Public Facilities, Entrances, Stairwells, Hotels, Retail Stores, High Abuse Areas, Hallways, Balconies, Condominiums, Schools.